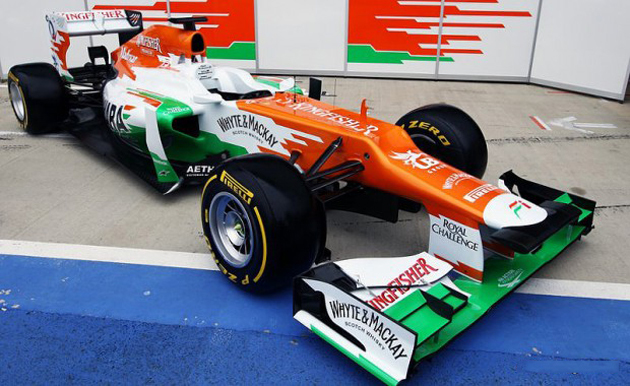 Sahara Force India has revealed the 2012 Challenger as Nico Hulkenberg Paul Di Resta pulled the covers off the VJM05 at Silverstone. Both were joined by Jules Bianchi, a reserve driver as the new car of the team was showcased for the first time. The VJM05 is the 2nd vehicle to be designed and developed under the supervision of Andrew Green, a Technical Director as team seeks to build on its 6th position finish in Championship of constructors. Dr. Vijay Mallya, Managing Director and Team Principle said that they have set their sights on challenging for 5th position and for doing this, they will have to start with new campaign by providing the type of form they displayed in 2nd half of last year. Mr. Otmar Szafnauer, Chief Operating Officer echoed those sentiments as he praised the efforts of the team to design and engineer the VJM05. The VJM05 comes with significantly stepped nose section like the one found on Ferrari F2012, which was also introduced on the same day. Powering the VJM05 will be a 2.4 liter Mercedes Benz V8 engine. Both Hulkenberg and Di Resta will be in their 2nd year as Formula One drivers. The Di Resta was reserve and test driver for Force India in the year 2010, whereas the Hulkenberg performed same role in 2011. Once again the Sahara Force India vehicles will be propelled by Mercedes Benz engines with transmission supplied by McLaren Applied Technologies. It will be the 2nd season with Mercedes KERS.